I hope everyone had a great holiday week if you celebrated Thanksgiving. I had an almost perfect wax week the exception of one wax. 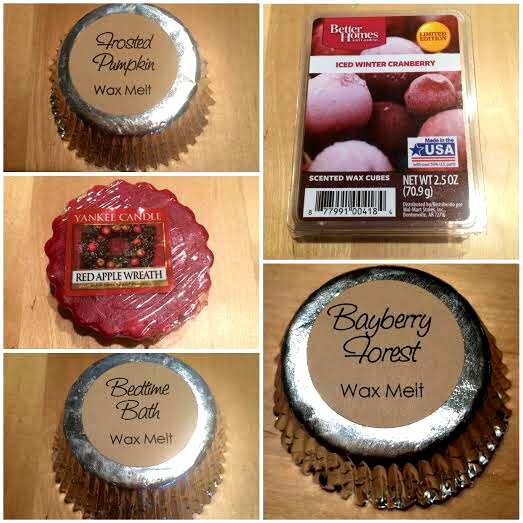 I've been breaking out more of the holiday wax lately, but I think I'm still going to try to balance it out still. I don't want to burn out on holiday wax! My Experience: No, this wasn't the wax I didn't like this week. I'm not a bakery fan in the least, but I like Frosted Pumpkin. I melted this one while Thanksgiving dinner was cooking, so I think that's why this one worked for me. I find this is heavy on the pumpkin spice element with a hint of sugary notes from the frosting. It's sweet, but it's balanced out well with the spice and pumpkin. It really smells delicious and I oddly didn't tire of this one like I do with practically other bakery scent after an hour. Scent Description: This inviting blend with the merry aroma of sweet apples, cinnamon, walnuts and maple sets the stage for a heartwarming homecoming. My Experience. This one was absolutely worthless. The lovely scent description is accurate when you smell it on cold or if your nose is practically touching the hot wax when it's warmed, otherwise this had absolutely not throw whatsoever. I couldn't smell this at all when warmed. My Experience: This smells just like the Johnson & Johnson lotion. I actually use this lotion on myself many nights and I'm not a baby. I used this one in my bedroom and loved it. It has that soft lavender, not an herbal lavender (I love that type too) mixed with chamomile. This is scent is soft, soothing, and perfect for bedtime. This one had a great throw to that lasted for several hours. I had this melting in my bedroom probably for 4-5 hours a night over 6 nights, so that's around 30 hours of scent! Love this one! I just ordered it in TDC's room spray too. My Experience: This is an excellent Christmas greenery/tree scent if you're not a fan of some of those heavier and earthier Christmas tree scents. This is bright, crisp, and fragrant. I think the blend with those fruity notes and the bergamot really brightens up those heavier tree notes. It's an excellent blend of notes that's festive and perfect for this time of year. My Experience: Excellent cranberry scent. I would say this is 70% tart cranberry and 30% sweet cranberry. The tartness is what makes this scent for me as you know I don't like overly sweet scents. This is perfect. It almost smells like wine to me. This scent has some depth and richness to it that I love. It has a strong throw, but its not unpleasant or overpowering. This scent is very natural and I don't find it artificial. I'm pretty sure this is a dead on dupe for Bath & Body Works Frosted Cranberry too!